Task Killer will quickly terminates applications, processes, Windows services, etc. 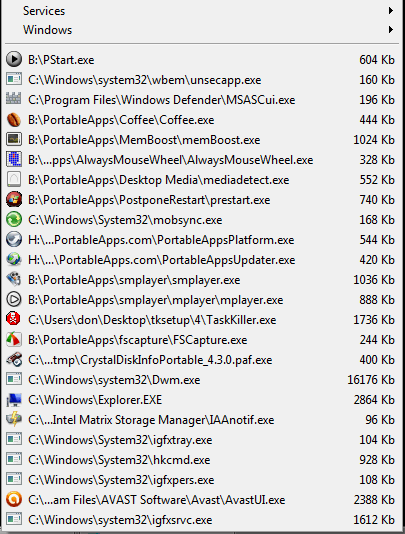 Simply click on the Task Killer icon and select the application / process / service from the menu list. The program features customizable hot-keys (global), command-line support, and a "Smart Kill" mode with a safer way to kill a program than the standard Task Manager. Languages: Catalan, Simplified and Traditional Chinese, Èesky, Deutsch, Français, Hungarian, Polish, Portuguese, Russian, Spanish, and Ukrainian.